Reeling: Reeling is preparing the length of the yarn, loosely tying it in bundles. This is done prior to the dyeing process. The yarn is put into the reeling machine; it is reeled separately for tana (warp) and bana (weft). 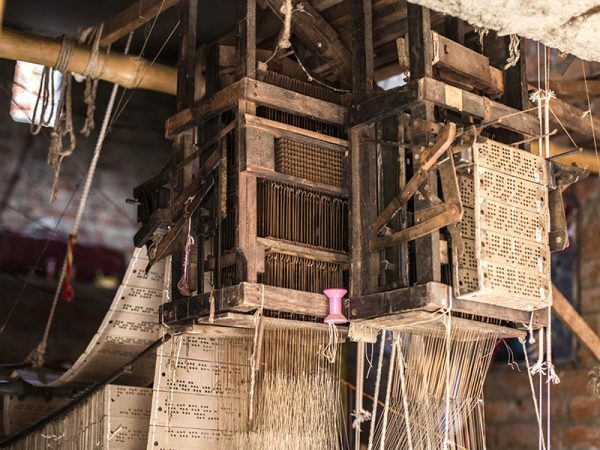 A charkha type spinning wheel is used to wind the yarn on the nari (bobbin). 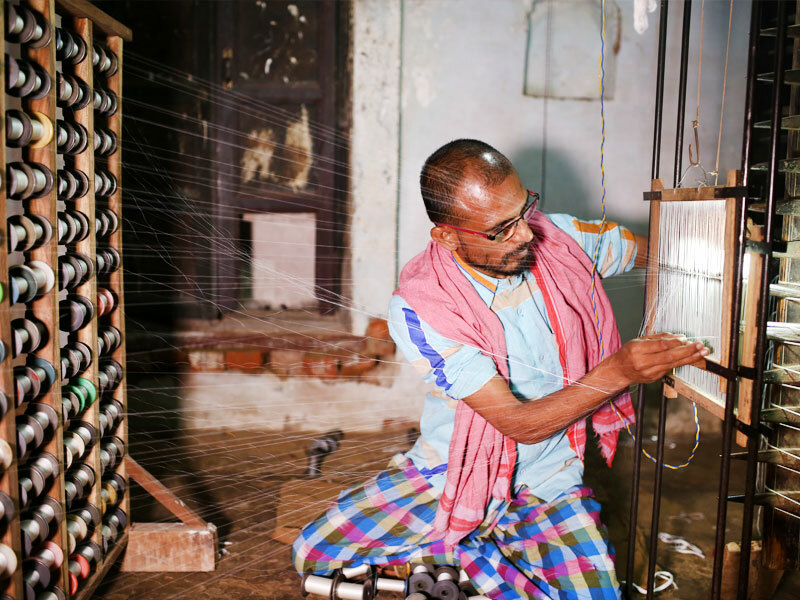 The yarn for bana is then rolled on a cylindrical structure, called ‘nari barana’. The tana yarn is rolled on a ‘dharki’ (a shuttle). 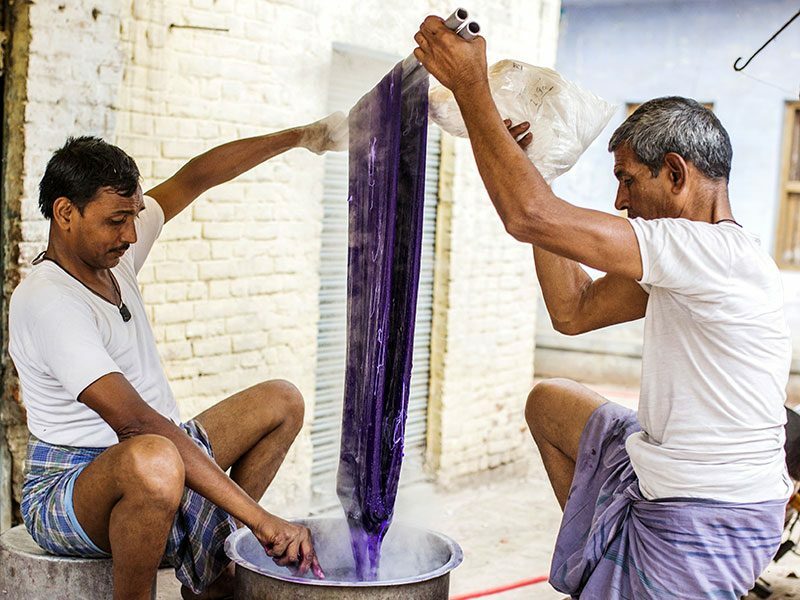 Dyeing: The yarn is dyed to give it color. It is usually done with acid dyes. Before the dyeing the yarn is put in boiling soap water to give the product a shiny texture. It is only after this, that the yarn is bleached and dyed. 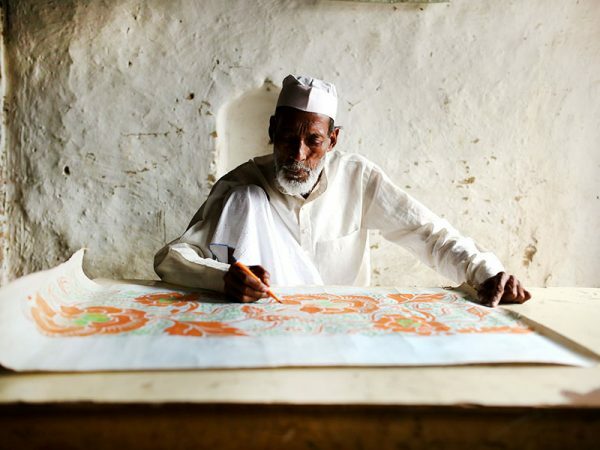 ‘Naksha Patta’ or Pattern making: Once a design is selected, it is drawn on graph paper and punched on perforated cards. These cards are called- ‘naksha patta’. Naksha Pattas are created for each small design. 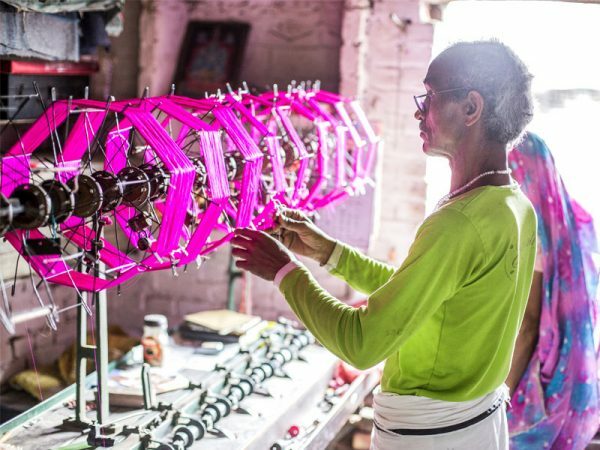 Usually a Benarasi saree requires hundreds of naksha pattas to complete it. 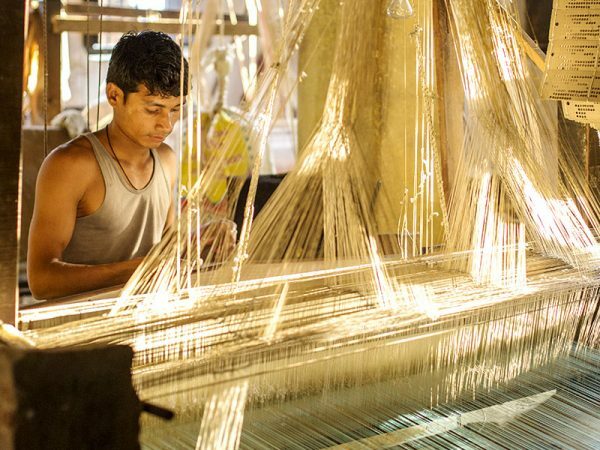 Weaving: The weavers usually weave on a pit loom. The warp yarn is rolled on a large cylindrical structure. It is on this that the dyed tana yarn is prepared for weaving. 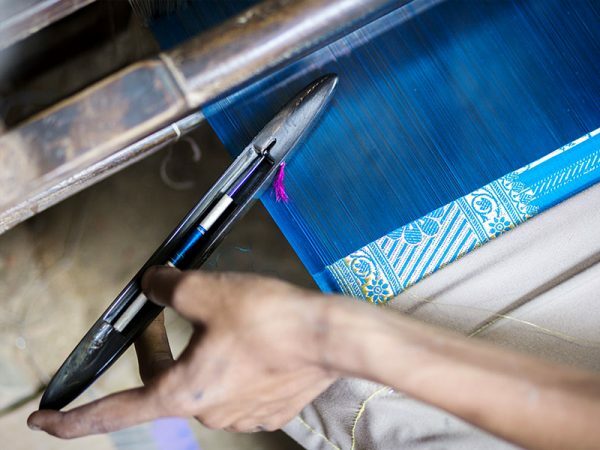 The length of the yarn is loaded on the cylinder depends on the length of the saree to be made. Then all the warp threads are threaded in the heald eyelet in the loom. It is in this that the threads move up and down. The reed functions like a comb that controls the separation of the tana threads. The open space between each wire is called dent. Helped by a hook, the warp thread passes through the heald and then the dent. This is the denting process. 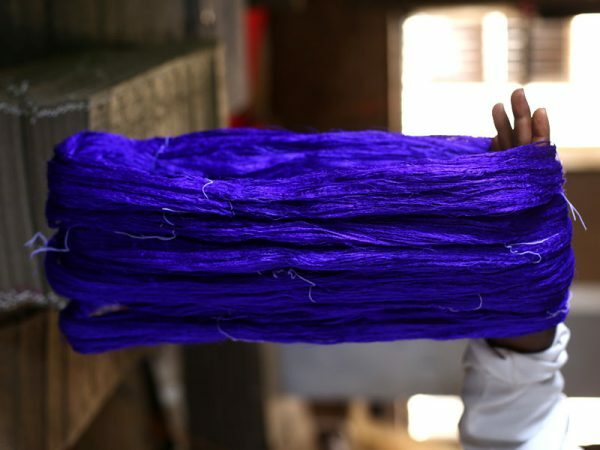 In this process, different techniques such as jangla, jamdani, tanchoi, kharua, etc. are used to produce different types of patterns. The final aspect of a Benarasi saree is the ‘zari’. This is a golden thread that is produced by melting silver ingot. It is 13 microns in diameter. The thread is made thinner and electroplated with gold. 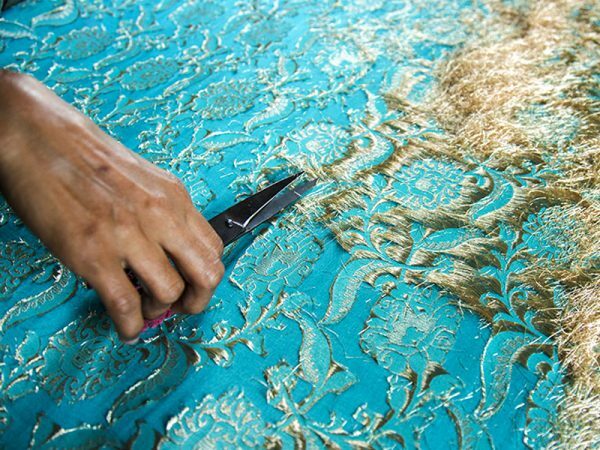 Finishing: Depending on the product, intricate zari embroidery is woven on some sarees (this is called Karpuchi). Otherwise, all sarees go through the cutting process, which involves cutting on tiny left over threads on the reverse side of the fabric. This is followed by folding and packaging.